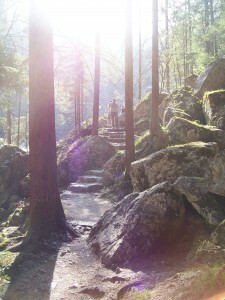 In 2007, my husband, Chris, and I took a trip to Bavaria, Germany. For the entire length of our trip I felt like I was in a magical kingdom. 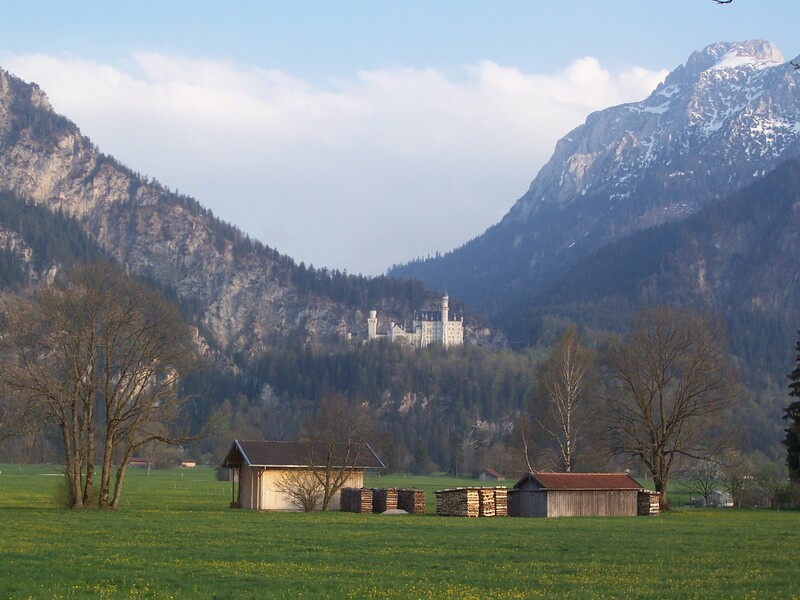 On one afternoon in particular, we visited the famous Neuschwanstein Castle in Schwangau, Germany. Our visit was enchanting, and as we drove away from the castle, I couldn’t help but steal one last glance out our rearview mirror. What I saw took my breath away. I begged my husband to pull over so I could capture on film the image that was stealing my heart. There in the midst of farmland, barns ,and houses sat the castle, a perfect symbol of a fairy tale. Before my eyes two worlds collided: the everyday ordinary world my heart longs to escape, and the fairy tale world of beauty, adventure, and romance my heart longs to jump into. Perhaps it was in this moment, that my idea for this blog was born. Granted, it took me another five years to get the ball rolling, but here it is, Once Upon A Writer, a website dedicated to my love for writing, my love for God, and my love for the fairy tale He is writing all around me…all around us. The story He writes for us is a story full of beauty, peril, adventure, and romance. But most of all, it is a love story. We don’t have to escape the world we live in; we just have to wake up to the fairy tale written on the pages of our hearts. This blog, these posts, are my attempt to capture for me, for Him, and for you the story of His love. Once upon a time there was a writer… she fell in love with a King… and wrote happily ever after. Short and sweet, this group of posts is a celebration of the beauty, adventure and romance that fills our lives when we walk with the King. My hope is to shine a spotlight on the fairy tale God is writing all around you. My dear friend, Cara Strauss Contreras, and her family of four live in Bolivia where they have been working with women in prostitution since 2006. Cara’s ministry is one I have a ton of passion and respect for, and I know that she, along with Word Made Flesh, and Suti Sana, are doing a tremendous work in the lives of the women they are serving. 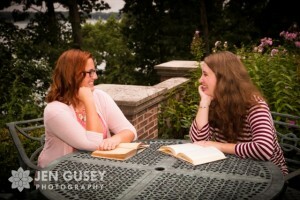 Each post in this category is either a guest post written by Cara, who is also my long time writing buddy, or my attempt to share with you the stories Cara has shared with me through letters, emails, and ministry updates. Whether it’s a peek into my marriage or a story from my life as a mom of two small girls, this group of posts tells of the many ways I see God working in, through, and around my family. It’s a celebration of love, good times, hard times, and the ways God moves in our lives and home. With a heart for community and intimate friendships I love to write of the ways God has blessed me with friends. Sometimes the stories are my own and sometimes they are stories I have witnessed in the lives of dear ones around me. Either way, I hope this group of posts can relay the joy of relationships, in both good times and bad, and what God intends for us to experience through the gift of friendship. The story of God is first and foremost a love story. Full of beauty, adventure, and romance, I hope this group of posts captures, at least in some small way, the endless ways He loves, and the lessons He teaches me on a daily basis. Last, but not least, this category of posts tells of my love for the written word and the ups and downs that come with being a wife, a mom, and a writer. What more can I say? I long to live by my pen. I long to write of the heart. I long to tell the story of my King and to put into words the story of His love. Stumbled on your website from the Breathe Conference page. Am contemplating attending this year as it’s over my birthday and it’s been some time since I’ve been back to MI. We’ll see. Until then, will keep up with you on your blog here, and you’re more than welcome to come see me over at http://www.thiscrazylittlefarm.com! I’ve got a fun little farm and homeschool up here in AK and I like to share about it and what God teaches us with it all when I can.